Since July 2010, Sathya Sai volunteers have served dinner every Tuesday evening to the low-income, multinational community of Dandenong – about 30 km South-East of Melbourne. About 50 Sathya Sai devotees from Victoria and other areas serve rice, pasta, sandwiches, fruit custard (in summer) and soup (in winter), as well as coffee, tea, Milo (drink), and fruit juice to about 40 – 60 needy people every week. After the service surplus food is given to homeless shelters. 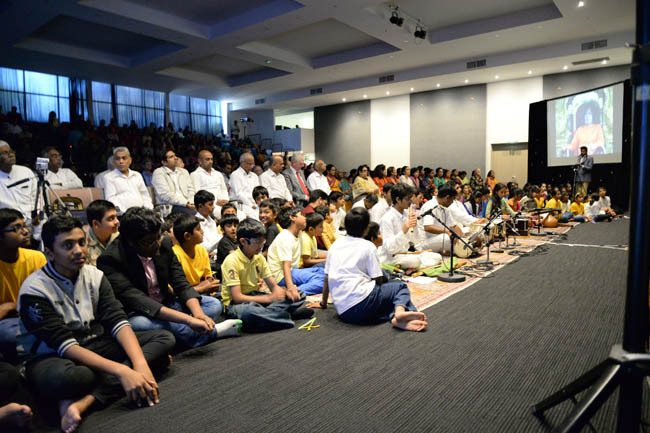 On 17th May 2014, about 700 people attended an event focused on Mother Earth, in Silverwater, New South Wales to celebrate Easwaramma Day. A play entitled “Saitopia” was presented by 40 Sathya Sai children with emphasis on revering one’s motherland, serving with faith, chanting God’s name and developing inner happiness. Clothing, blankets, and non-perishable food were donated to St. Brigid’s Church at Marrickville for distribution to the needy.